Quinoa is native to Peru and was called “The Mother Grain” by the Incas. I enjoy having it on a salad or making Quinua Atamalada, a savory quinoa stew. But did you know quinoa can also be used in desserts? 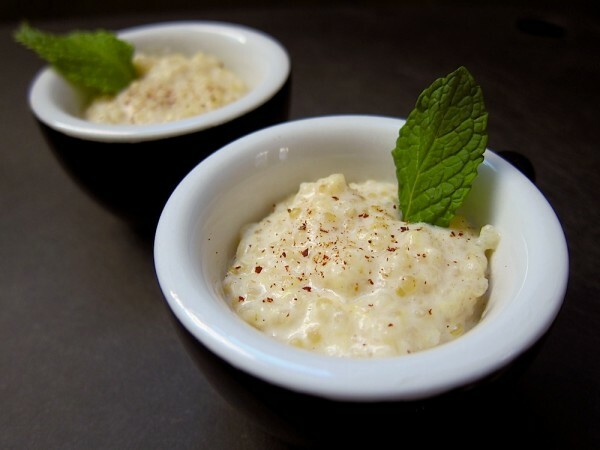 Inspired by the traditional Arroz con Leche, or rice pudding, this Quinua con Leche is slow cooked goodness infused with the wonderful aroma of cinnamon, cloves, and star anise. Although quinoa is cooked like rice, quinoa doesn’t have starch so cooking times are a little longer. Also, the creamy consistency will be different. But after several hours in the kitchen trying different ingredients, I was very happy with its flavor and consistency. Besides the quinoa, the other ingredient that makes this dessert unique is the panela, or raw cane sugar, which is also used to make the syrup for Picarones. Some may argue that using quinoa and raw cane sugar makes this dessert extra healthy, but for me the real pleasure comes from cooking it. After all, this dessert is a true combination of Inca and Spanish cultures, and of the ingredients, spices, and techniques, that came together over 500 years ago. And if you close your eyes when you take a bite of this special dessert, you’ll get a taste of its sweet history. In addition to the ingredients above you’ll need a fine mesh strainer for washing the quinoa, a saucepan with a thick bottom, a wooden spoon for stirring, and a bowl for the pudding after it’s cooked. Wash the quinoa using a fine mesh strainer until the water runs clear. Add 1 1/2 cups of water, the cinnamon stick, cloves, star anise, and pinch of salt to a saucepan, and bring to a boil, uncovered. Add the quinoa, reduce heat to a simmer, and cook covered until water is absorbed or about 15 minutes. Add the whole milk and sugar, return to a boil, then reduce heat to a simmer and continue to cook uncovered, stirring frequently, until creamy in consistency or about 40 minutes. Remove from heat, transfer pudding to a bowl, and use a fork to remove the cinnamon stick, cloves, and star anise. Serve warm in a small bowl, cup, or ramekin, sprinkle with nutmeg zest on top, and garnish with a mint leaf. This recipe yields about 2 1/2 cups of pudding. Or about 20 oz. which can be divided into 10 servings of 2 oz. each. In step 3, the quinoa is cooked in water using the traditional ratio of 1 part quinoa to 2 parts water, so it should not be mushy after the water is absorbed, nor should it stick to the pan. In step 4, the pudding should be creamy but not too thick or overcooked. If you can see the bottom of the pan when stirring with the spoon, then it’s done.